Also serving communities of Bayville, Lanoka Harbor, Forked River, Whiting. There are 21 Assisted Living Facilities in the Toms River area, with 5 in Toms River and 16 nearby. To help you with your search, browse the 161 reviews below for assisted living facilities in Toms River. On average, consumers rate assisted living in Toms River 4.1 out of 5 stars. Better rated regions include Brick with an average rating of 4.5 out of 5 stars. Caring.com has helped thousands of families find high-quality senior care. To speak with one of our Family Advisors about assisted living options and costs in Toms River, call (855) 863-8283. Toms River, New Jersey, the county seat of Ocean County, is situated along the coast of the Atlantic Ocean. It's easily accessed from the Garden State Parkway and has a population of 89,791, 18.5 percent of whom are 65 and over. 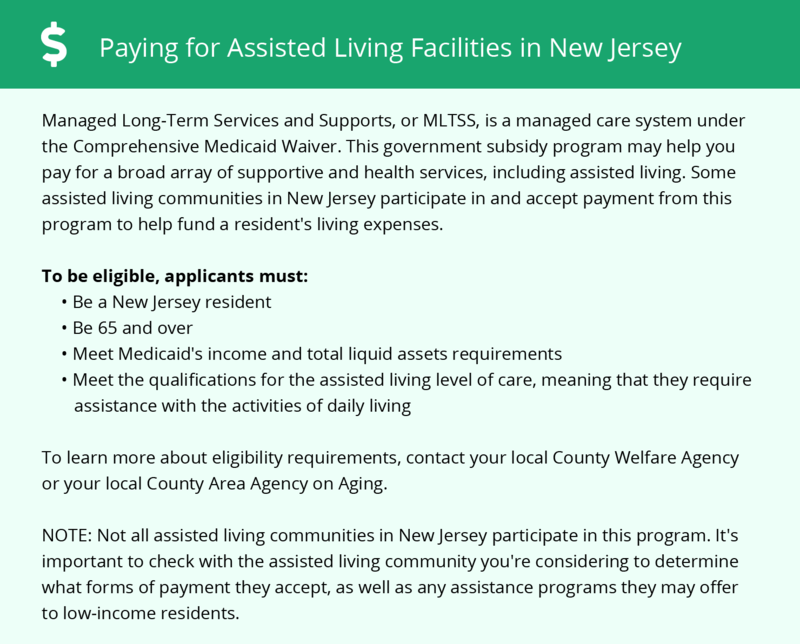 To accommodate local seniors requiring help with daily tasks, there are five assisted living facilities located in Toms River and 25 more located in nearby neighborhoods. In Toms River and throughout New Jersey, there are three kinds of assisted living facilities; they include assisted living residences (ALRs), comprehensive personal care homes (CPCHs), and assisted living programs (ALPs). All facilities are licensed and regulated by the state's Department of Health and Senior Services. The highest average temperatures in Toms River occur in July at 76 degrees, while in January, average lows hit 31 degrees. December weather brings up to 12 inches of rain and snow, which can challenge seniors with mobility issues. The air quality index in Toms River is 19 percent better than the U.S. average, while the pollution index is 115 percent worse than the national average. This may be a concern for seniors with allergies, asthma and respiratory conditions. The cost of living in Toms River is 3 percent lower than the state average but 21 percent higher than the U.S. average, so many seniors relocating from other parts of New Jersey can enjoy about the same standard of living. New Jersey is moderately tax-friendly to seniors. Social Security payments aren't taxed by the state, and state income taxes are low for retirees with less than $65,000 in income from retirement accounts and pensions. Unfortunately, property taxes here are the highest in the country. Toms River's overall crime rate is 26 percent lower than the national average, which translates to about 6 crimes committed daily per 100,000 people. Toms River is safer than 64 percent of the cities in the United States. The Toms River area is home to world-class medical facilities, including Community Medical Center, in the event of medical emergencies or illness. Assisted Living costs in Toms River start around $0 per month on average, while the nationwide average cost of assisted living is $4,000 per month, according to the latest figures from Genworth’s Cost of Care Survey. It’s important to note that assisted living rates in Toms River and the surrounding suburbs can vary widely based on factors such as location, the level of care needed, apartment size and the types of amenities offered at each community. 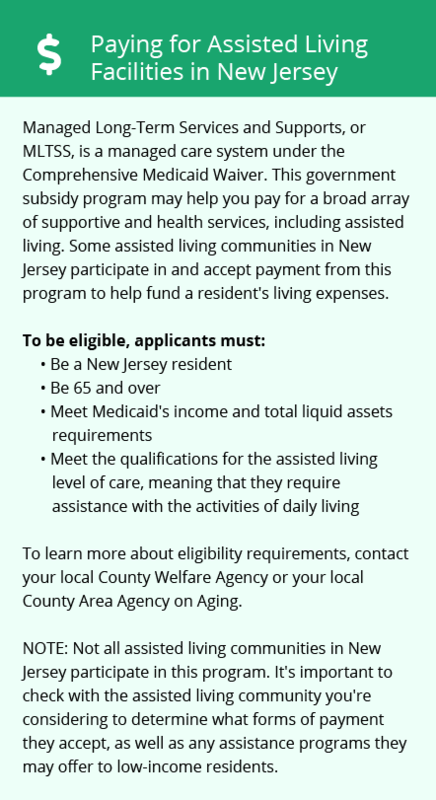 Financial assistance for assisted living facilities in Toms River and other areas of New Jersey can be obtained through the state’s Medicaid program via the 1115 Demonstration Waiver program. All assisted living facilities in the state have to reserve 10 percent of their beds for Medicaid recipients, and family members may supplement the program to get a private room. To see a list of free assisted living resources in Toms River, please visit our Assisted Living in New Jersey page. Toms River-area assisted living communities must adhere to the comprehensive set of state laws and regulations that all assisted living communities in New Jersey are required to follow. Visit our Assisted Living in New Jersey page for more information about these laws.